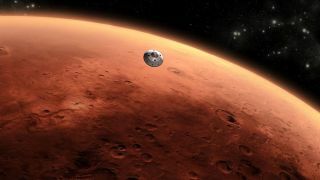 Humanity has been sending spacecraft to Mars since the Soviet Union launched Marsnik 1 on Oct. 10, 1960 (but it failed to reach its goal). To mark the latest Red Planet arrival — NASA's huge Mars rover Curiosity — SPACE.com has taken a look back at some of the most spectacular successes (and failures) in humanity's bid to reach the Red Planet. Click the "Next" button for our list of the most audacious attempts to explore Mars. NASA's golf cart-size Spirit and Opportunity Rovers launched to Mars in 2003 and used giant airbags to cushion their landings in January 2004. The amazingly long-lived rovers far outstripped their planned missions of 90 Martian solar days. Spirit plugged away until April 2009, when it got stuck in deep sand. It went silent on March 22, 2010 and was declared dead a year later.